Extraction site preservation for future dental implant fixture placement. Does the use of extraction site preservation interventions result in better maintenance of the ridge height and width after tooth extraction (in the esthetic zone: anterior teeth and premolars) than does no intervention (natural healing)? Two online English-language databases were searched through June 2010. The studies that were reviewed included randomized controlled trials, controlled clinical trials, prospective cohort studies and and case series comparing socket preservation therapies with no treatment. There were 4 studies altogether. The study interventions included a variety of bone augmentation techniques using, bone fillers, collagen sponges, recombinant human bone morphogenic protein and membranes that were resorbable or non-resorbable. The article describes and compares at some length the studies that were evaluated. However, the conclusion drawn from the review is that although socket preservation interventions may aid in reducing the bony dimensional changes after tooth extraction, they do not prevent ridge resorption. Commentary in the latter part of the article states that esthetics is an important outcome for patients receiving implant-supported restorations. To achieve this outcome, patients need to have good bone volume and quality, as well as good bone and soft-tissue height. The implications from the review were that extraction site preservation is important for achieving optimum esthetics with implant restorations. The authors of this review generally reported improved alveolar height and width for socket preservation interventions compared with sockets that healed naturally. The data, however, was limited and clinical significance could not be inferred. Good bone level alone does not imply improved esthetics. More studies are indicated. Whether you have two legs or four, your teeth are important to you. Schedule your six month checkup now! Boynton Beach stylist wanting more “dental style” in her smile! Recently, I began a case which at this time, is now halfway completed. The patient, Linda, who by profession is a hair stylist, presented to my office with the desire to replace her upper anterior veneers. They were 15 years old. This is represented by the pre-treatment picture above on the left. After a complete review of the patient’s teeth, as well as a review of a complete series of digital intraoral x-ray films it seemed inappropriate, perhaps even a mistake, to reconstruct her dentition to form and function using some combination of Porcelain Veneers and removeable prosthetics at this time. It might have been clinically acceptable some time ago for this dentition, but not at this time. The anterior teeth were not periodontally involved, however they were slightly mobile. To remedy the problems that she presented with at the outset of this case, I chose to prosthetically bridge the upper anterior teeth with a Porcelain Fused to Gold Alloy fixed prosthetic reconstruction. To eliminate “unsightly” clasps when she smiled, I chose to use semi-precision attachments. In that way the patient never shows clasps when she smiles. This is represented in the picture above on the right. The prosthetic care is now halfway completed and we look forward to posting the reconstruction of the lower arch in the near future. We are grateful for this five star rating from a recent patient visit in our Boynton Beach Dentist office. My experience was wonderful. Would highly recommend. — Erin L.
Dr. Indictor can fix your chops. He can’t do a thing for your Schnauzer! 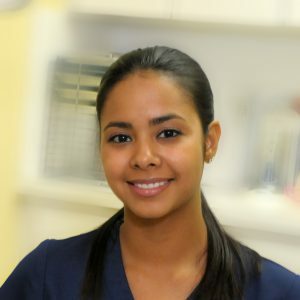 Our hygienist was born in New York; the Bronx to be exact. She came to Florida with her family in 1994; more specifically to Boynton Beach where she and her family settled. She graduated Boynton Beach High School in 2005. It was there that she began to entertain the idea of having a career in the allied dental health profession as a hygienist where you work with people on a”one to one” basis. She completed her hygiene program of study at the Palm Beach State College in 2009. While her formal training may be over, she has aspirations to continue her education . When she is not working with patients Adrianna, enjoys going to the gym to workout. She knows the benefits of good health and being physically fit. She also knows about good dental health. Just ask her! She loves to talk shop and educate her patients. We’re lucky to have her! When I brush my teeth I like to listen to my favorite composer. Do Titanium Implants Age Biologically? Implant Dentistry. 21(5):415-421, October 2012. This is the official journal of the International Congress of Oral Implantologists. One of the authors is an Assistant Professor in the Department of Prosthodontics at Yonsei University in Seoul, Korea. The other author is a Professor in the Laboratory of Bone and Implant Sciences, at UCLA School of Dentistry, Los Angeles, California. The authors introduce the notion supported by citing human and animal trial studies (in vivo) as well as controlled environment studies (in vitro). This is a seminal article presenting the concept that there is a time-dependent reduction in the biologic degradation of titanium. It provides insight in the ability of the titanium to cause the attraction of bone as well as other biologic reactions, from the time that it was initially processed. They define the phenomenon as “biological aging”. The article provides insight to further expand the scope of our understanding of osseointegration to further improve implant surfaces in the future. Metals fatigue. They oxidize. They age as well. Moreover, the biology of the person or animal into which the implant is placed also changes. With age comes maladies such as Diabetes, Thyroid Pathology, Liver Pathology, Kidney Pathology, etc. All affecting the survival of the implant(s) and the biologic system carrying them. Perhaps titanium’s ability to conduct bone does decrease with time. An interesting read on a concept that will be questioned and speculated on for some time to come. At East Boynton Dental we try stay at the cutting edge of the latest research. 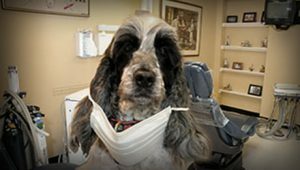 Come on down to East Boynton Dental and meet Derby! We clean teeth… especially your CANINES! I’m “Top Dog” at the office of East Boynton Dental! Be top dog amongst your friends and have the whitest teeth in the neighborhood!